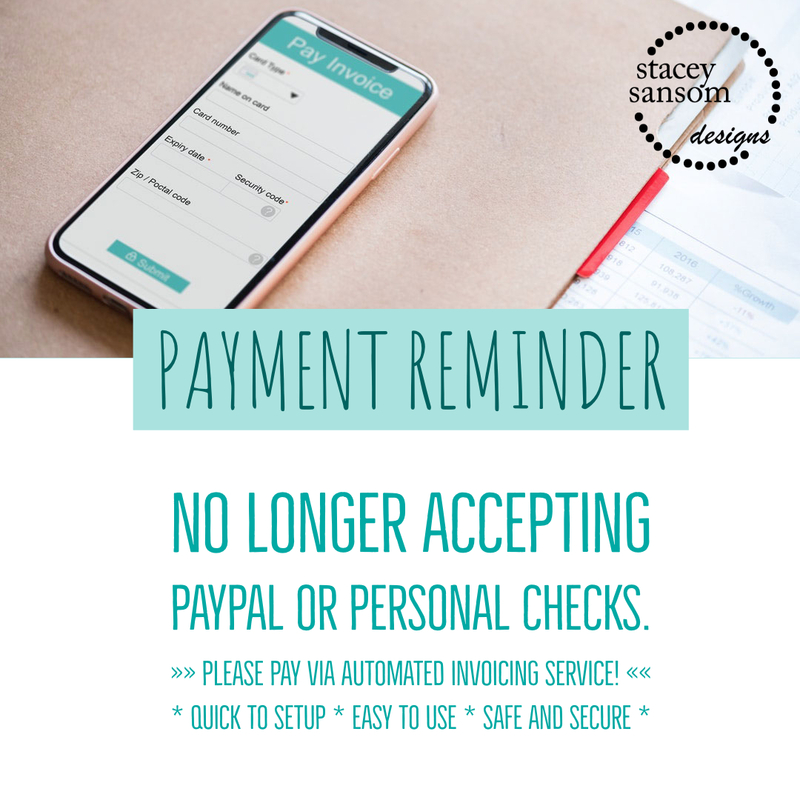 Please note that Stacey Sansom Designs no longer accepts payment via PayPal or Personal Check. These changes were announced previously but have not been strongly enforced. In the future, your payment will be rejected if you pay via PayPal or submit a Personal Check for payment. As other payment options become available, I will consider adding additional payment methods. Automated and digital payment options are changing and we will try to bring you the easiest and most secure options available. The fees for PayPal are adding up. Bookkeeping gets crazy managing multiple payment handling and transfers. Not everyone is honest and payment does not always go through with a personal check. Payment is automatically credited to your invoice upon payment approval. How do I pay my Stacey Sansom Designs invoice? If you received an invoice, you received a link to pay your invoice. Simply pay via your electronic invoice, or going directly to the link provided on your invoice. You can decide what fits you best. Business checks will still be accepted on a case by case basis. I will highly encourage all customers currently paying via Business Check to begin using the Bank Draft option through the automated invoicing system. The automated system uses a payment processing gateway that is safe and secure. Most payments are easy to setup (take only minutes). You set this up. I never see any of your personal banking information accept for what is necessary to identify your payment on your invoices. The system automates this. This system is safer than sending payment via the USPS and other postal services. Unfortunately, lots of people are dishonest and there have been reported instances of people swiping mail from mailboxes in our area. These steps are being taken to help protect your information and payment. Additional changes may occur from time to time. I will always post here on this website about these policy changes. Please follow us on Facebook, Instagram, and Twitter for additional updates. Sign up for our email newsletter for exclusive savings and updates. I want to personally thank each of your for your business. You are why I do what I do. Thank you for being understanding about this matter.